Not wanting to be swayed by my disappointment with the Hults HY20 axe, I went ahead and bought the Trekking axe, it's also known as the Hultafors Hatchet, and it's a handful of a hatchet. After the problems I had with the last axe, I intentionally bought this from Heinnies and specifically asked that they quality check the axe before it was sent and I have to admit, this one is a cracker! 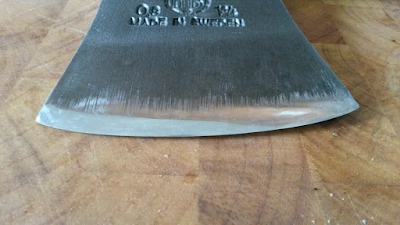 The edge wasn't bad, there was no burr, it was evenly ground and was sharp enough when I received it, the grind marks weren't as bad on this one as the last one. it seemed to be hung correctly, very little gap around the head and was properly centered on the helve, as a matter of fact it was fitted better than my Gransfors SFA. The grain in the helve was perfect and running vertically as you can see, there shouldn't be a problem with this one showing any signs of weakness. I tried it out without any refinement of the edge to see how it performed on a fallen scots pine and it bit in and chopped nicely, throwing great lumps of wood with every swing. After a day of use the edge was good, still sharp but as usual I took it to the next level and sharpened and polished it so that it was hair popping sharp. It seems to be a relatively soft temper, easy to remove metal and nice to sharpen, the steel responded well to the stones I used and it turned out lovely, I'm very happy with this one. I have seen it advertised as the Hultafors Hatchet but at 2 1/2lbs it's a mighty weight to swing for any length of time single handedly but it does seem to work well with two hands although an extra couple of inches on the helve would make it much easier, but then it wouldn't pack so well so it's horses for courses. I like it, smaller but heavier than the Gransfors SFA and certainly more packlable. It punches well above it's weight and takes a lovely edge if you put in the time..I'm sure it'd certainly build up your forearm if it's used regularly.. If Thor carried a hatchet instead of a hammer he would probably carry this one! Hence what I've nicknamed it.. the Thorax!.